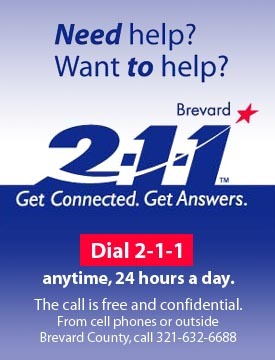 This September, many Brevard residents found themselves dialing 2-1-1 for information to help them prepare for, weather and recover from the hurricanes Charley, Frances and Jeanne. What some may not have realized is that this resource is available year-round, twenty-four hours a day, to help people get connected to and get answers about important community services and volunteer opportunities. Named 2-1-1 Brevard Inc. since 2003, the private, not-for-profit organization has served Brevard County since 1963. In July 2000, the Federal Communications Commission designated the 2-1-1 dialing code for use in accessing community services, much like 911 was designated for accessing emergency services. Ten months later, Brevard County became the first community in Florida and the seventh in the nation to make its services available by simply dialing 2-1-1 from a land line. The agency is currently working to raise the funds required to allow 2-1-1 dialing from wireless phones. Trained 2-1-1 counselors can help connect callers to information about local governmental, health and human services and volunteer opportunities. The agency maintains a comprehensive database of these services which include programs that assist with basic needs, emergency financial assistance, parenting classes, mental health and substance abuse services, domestic violence shelters, mentoring programs, community activities and more. During the hurricanes, the agency also worked to maintain up-to-the-minute information on services needed by those impacted by the storms. 2-1-1 Brevard is supported by the United Way of Brevard County, the Florida Department of Children & Families, the Brevard County Board of County Commissioners, the Brevard County Health Department, and the support of individuals and organizations. For more information on 2-1-1 Brevard, or to use the agency’s online directory, please go to www.211brevard.org.